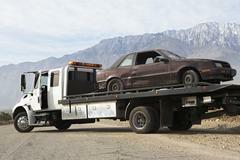 The San Bernardino County Sheriff’s Department will begin the Open Enrollment selection for rotation tow providers for the 2019-2020 year. Applications will be accepted starting March 1, 2019 and ending on March 31, 2019. No late applications will be accepted. The application can be found towards the back of the Tow Service Agreement (TSA) on the Sheriff's website (http://wp.sbcounty.gov/sheriff/about-us/tow-service-agreement/). Please refer to the TSA to answer any questions regarding the agreement. Applications must be submitted to your local Police or Sheriff’s Station during the Open Enrollment period between March 1, 2019 and March 31, 2019.